Honolulu & Waikiki Beach - key filming locations for "The Descendants"
The opening scene of the movie “The Descendants” depicts a woman riding in a speeding boat just off the shores of famous Waikiki Beach here. The movie’s penultimate scene is also filmed near the same spot. 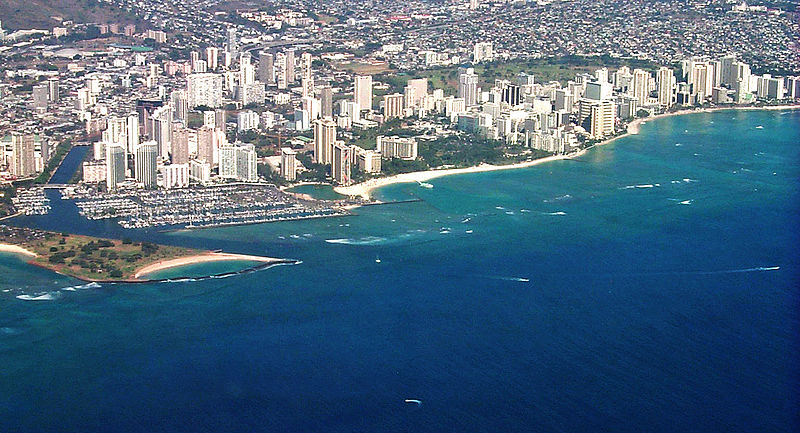 It’s about a half mile offshore (extreme right of photo above), with the Honolulu skyline and the iconic Diamond Head volcano in the background. Queen's, art museum, library, downtown. The next scenes after Waikiki, at the movie’s start, and also the scenes just prior to the Waikiki denouement, were shot at Honolulu’s Queen’s Medical Center. (Shot the same day too? Just wondering.) Most locals call it Queen’s Hospital – it is the largest private hospital in the Hawaiian Islands. (No, this is not the hospital that President Barack Obama was born in; that’s Kapiolani Medical Center, just down the road.) 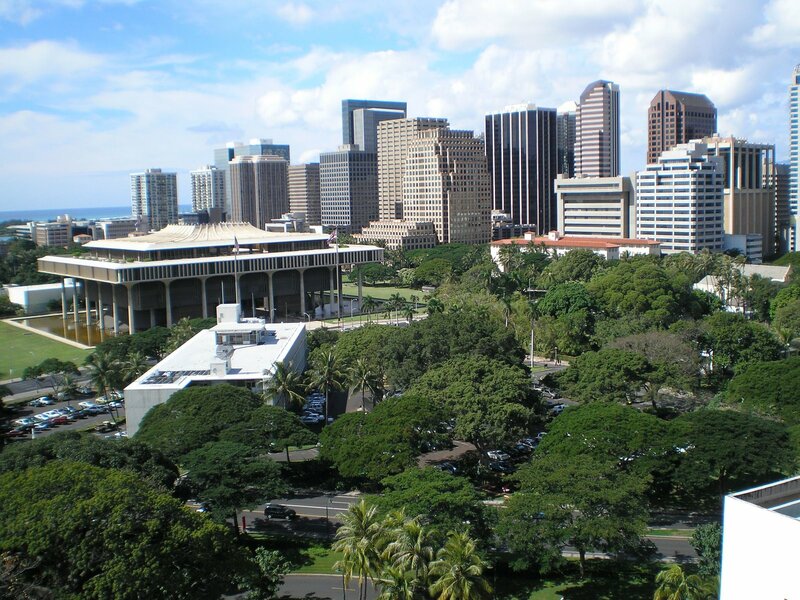 Some of the scenes looking out of the hospital windows are of the park-like setting around the Hawaii State Art Museum, the state library and of Iolani Palace. It seems the office location for Matt King (George Clooney) was shot in the same area, which is sometimes referred to as old downtown (just behind the marina in the shot above). The King Residence in the Nuuanu neighborhood. Where was the house that Mr. Clooney supposedly lived in? On a small street in the Nuuanu neighborhood, which is just up the Pali Highway north of downtown. Not that anyone cares now, but the cast and crew stayed at Honolulu’s Kahala Hotel & Resort during filming on Oahu. That was close to the neighborhood where they were driving (in the movie), when they happened to spot a certain real estate sign. From Honolulu, the movie made a quick hop to the Big Island. The dark roadway with the white rocks spelling people’s names? That’s Queen Kaahumanu Highway (State Road 19, part of the Hawaii Belt Road) through the lava fields, north of the Kailua-Kona airport. 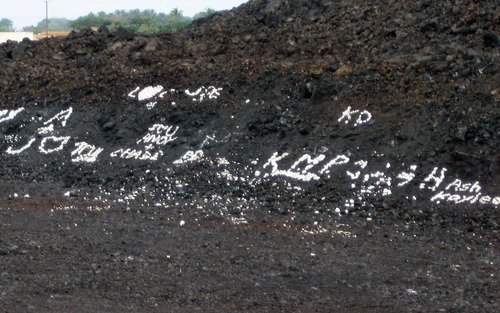 It’s a Big Island tradition to spell out things, and create lapidary graffiti, using white coral rocks along the roadway. It’s a local tradition, best left to the locals to understand (and explain!). I suspect only a second unit film crew went to the Big Island. There was no reason for the stars to go there. The private school shown in the movie was actually a property on Oahu. The movie’s scenic factor was ratcheted up a few clicks when everyone flew to the island of Kauai. The helicopter shots of those lush green mountains? 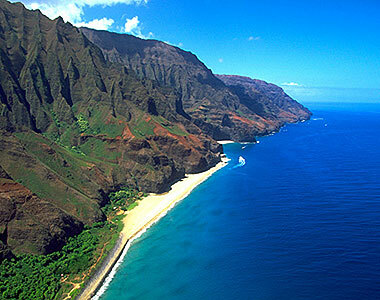 Along Kauai’s fabulous, unspoiled NaPali coast, which is preserved as a 6,175-acre state park. Want to visit? You can actually hike the coast on the Kalalau Trail, which is about 11 miles long. It is not accessible by automobile. If it seems to you that, when you saw this coast, you had a sense of deja vu, you are probably right. It has been used in dozens of movies over the last 60 years – starting with jewels such as “South Pacific” and continuing down through the years to “Jurassic Park”. There may even have been an Elvis Presley sighting or two around here. If you are interested, a movie location tour is offered by a local entrepreneur; the tour visits locations for at least 20 different movies filmed at various locations on Kauai. The shores of Hanalei Bay were where the cottage was located, where the movie’s big scene of confrontation was staged. Tours are offered in this area of “The Descendants” locations; other scenes were shot at the Tahiti Nui saloon/restaurant nearby and the shave ice shack. Finally, wonder where that fabulous piece of property, that Mr. Clooney’s character is so conflicted about in the movie, actually is? Eureka! Check out a separate column I’ve written, in which I set to find that chunk of Shangri-La! « Where Was George Clooney’s Kauai Ranch in “The Descendants” ? I don’t know. But I will try to find out. If any of our readers know, we’d appreciate your information on that subject! Thanks. Her style is very beautiful and distinctive. Surprised you did not comment on the restaurant used in Hanalei – and the history behind the extra at the bar and photo in the background in another scene…..
Where was the scene filmed in the end, when the cousins were voting. My brother has a house in Kauai and I wanted him to see the layout. I can’t seem to locate a picture. Thanks for your info. Interesting to read this post. We are going next week and I can’t wait. I believe that house was on Oahu across the street from “Pounders Beach” near Malaekahana. As an aside, if it’s the house I believe it to be, it’s the place for Senior Skip Day at Punahou School. And, it’s one of those old kama’aina homes for Punahou families that the movie references. That would certainly be an educated guess! Especially since Kaui Hart Hemmings, the novelist who wrote “The Descendants”, is a Punahou graduate! Thanks for your wisdom on this matter! OH, I made a comment further down on that house. 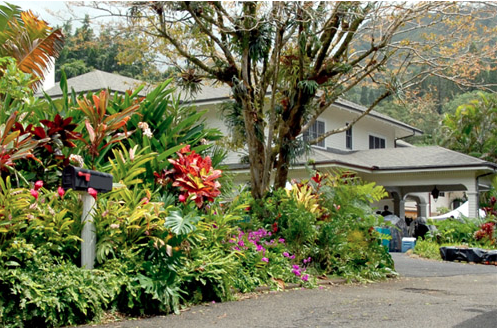 As another punahou grad, i totally agree that that’s the house we went to for our senior picnic. You are correct about the house being across the street from Pounders. The house is owned by the White family. Terry White graduated Punahou in 1963 and is an extra in the family vote scene. I believe the house is named Kikila and you can see the name on the screen door in the beginning of the scene. Do you by any chance have a photo of the fountain outside the King home? It looks so lovely, I want one for my house. According to something I read on the internet (so you know it’s gotta be true, right?) Kauai is right up there with Vegas as to real estate values now. Maybe in the percentage the real estate has dropped from where it was at the high point of the market. But it does seem like, if you want to move to Hawaii, Kauai might be your best bet! and have an exceptional appreciations for Hawaiiana. That’s home to me. The director should get an Oscar for “getting” Hawaii! whose picture was used to represent matt king’s hawaiian princess grandmother? it is in one of the opening scenes in the nu’uanu house. thanks. You didn’t mention the estate where the family met to decide the fate of the property. I’m guessing it’s accross from Pounders beach at Koolauloa on oahu. As a graduate of Punahou it looks like a place we went for our senior picnic…..is it???? Sure looked like it to me! Take a tour of the houses of The Descendants. This is the address on the living will for Elizabeth King. This address doesn’t seem to actually exist. This is the address for the house Matt King is living in, where the pool is in the front, the cement/concrete pots in front, the flagstaff properties in the back (note the 2 extra mailboxes) and its on the corner of Old Pali Road and Gartley Place. (96817). Owned by Craig and Joanne Chun. This is the address for the house Matt runs to, the place where Mark and Kai Mitchell are in the movie. Its owned by John and Tiare Finney. This the house across the street from Pounder Beach. Its where Mike King told the family he wasn’t signing documents to transfer the estate from the King Family to Don Holitzer. Its owned by a group – Kikila Partners. Part of the reason for doing all this research is two fold, people are curious and probably want to see these houses for fun. The other side to finding these houses is this – the elites, the lucky, the upper echelons of society have money. And with this money comes power and with his power comes the ability to make more money. These people made handsome money for renting these places for this movie. Yet they are fastidious about trying to keep these locations private and anonymous. Yet they want to taunt the rest of the world with their houses of beauty, wealth and power while at the same time try an anonymously take the money for owning these special places. What is very unfortunate is very little is being done in high cost of living areas to help with the housing shortages and crisis. They make us, the middle class barely squeak out a living renting from the land owners who take the fruits of our labor, earned income, and confiscate a large par of that as unearned rentier income. The landowners often protest any new development. What they are thinking is they are protecting the property values. That is all. They dont care about traffic, how bad the schools get, etc. They just want to keep things private and the way they are. However, all of us lower middle class people who need to provide the standard of living for these folks – we are the nurses, we are the para legals, we are the cooks, the chefs, the landscapers, the truckers. We have to live somewhere too, and we have to send our kids to school. We have gone from being the land of opportunity to the land where being middle class is a constant struggle. If the upper classes want to keep what they have, they must become involved in making middle class possible again. The trajectory we are on will lead to us all into hot bedding in overpriced rentals with multigenerational living a rule not an option while sending our kids to inferior schools. You know, I don’t really disagree with anything you say here. I encourage people who have seen the movie to also read the book. You could learn a lot about how Hawaiians actually live. It’s not all mai tais and ukelele music. Thanks for taking the time to research where the movie houses were. I can confirm that you are correct. I turned off the Pali Hwy the other day onto the Old Pali, and thought, “That’s Matt King’s house! Right here, hiding in plain sight.” I could write a very large book, just about the Old Pali Hwy, and what is along it. You have no idea – and that includes most Hawaiians. Its not just Hawaii either. The elites own the middle and lower classes now. And most of us will be paying them rent. Anyways, I found two more houses. This is where Lani and Barb Higgins lives and Scottie and Matt go to apologize to Lani. This is the house Brian Speer has for sale. The last one I’m looking for is – Scott Thorson’s house. I think its near Wailupe Beach park looking on Black Point. In the movie Scott Thorson’s house is around 36:38. This doesnt have the tell-tale turtle on it as it did in the movie. This is the address of Brian Speer where Elizabeth King was caught with Brian Speer by Alexandra King. Take a tour of the houses and filming locations in the movie The Descendants adapted from the book by Kaui Hart Hemmings. This is the address for the house Matt runs to, the place where Mark and Kai Mitchell are in the movie. This doesnt have the turtle on it as it did in the movie. This is the address of Brian Speer where Elizabeth King was caught with Brian Speer by Alexandra King. I strongly suspect based on the views that this is Scott Thorson’s house. The house in front says 130 Hale Aka’ula. The Descendants – Kauai Property – Kipu Kai Beach. This is the location of the bay view from the movie. This is the plot of land that the King family and cousins collectively own in trust and have the issue with trust in perpetuity. In 1976, I visited in the home where the voting scene took place. We had gracious hosts one, a Miss USA contestent the other an officer in the Coast Guard. I have not seen them since. The King family history sounds like their family’s. Thank you so much for this. My grandmother lived in Hawaii for 35 years before she died and I visited as often as I could. She and her husband (she remarried in her 60s) were members at the Elks Club in Honolulu and when I visited we were there every Thursday and Saturday night. I thought one of the scenes was filmed there and your blog confirmed it. When my grandmother passed away, we held her service on the patio of the club looking over the ocean and some canoeists scattered her ashes for us. This movie, and that scene in particular, brought back so many happy memories. Thanks so much for your kind words. What a lovely, peaceful place it is. I just saw the movie last night (Great!!). Let’s not overlook the airport in Lihue, Kauai! The start of fantastic vacations for many of us!! I was extremely pleased to uncover this page. I want to to thank you for ones time due to this wonderful read!! I definitely appreciated every part of it and i also have you bookmarked to see new information on your blog. Absolutely gorgeous settings here! I would love to be able to make it out to Hawaii someday to take all this in. It looks so beautiful. I just recently watched the Descendants and loved it, even though it was a bit of a downer movie. Wow! I just saw this movie on TV. I will have to buy the DVD now! This movie had so many poignant scenes for me. My Dad and I visited Kauai on my Birthday a year after my Mother died of cancer. My Husband was back home in Nebraska with his girlfriend. It was on the beaches of Hawaii that I decided to get a divorce. My Husband needed to decide who he wanted as life is short! Well, he decided on his girlfriend who quite oddly has the same name as I. They now have 2 children and just took a trip to Florida to celebrate their Anniversary. I am still brokenhearted and hoping to find love again. I don’t have children and not able to have children. Glad He is happy & has the joys of children- but it hurts like hell! !